A new report sets out a three year plan to complete PAD-US, the national inventory of the location of every public park and protected natural area in the United States. 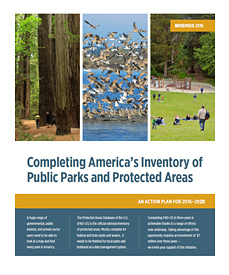 The report, Completing America’s Inventory of Public Parks and Protected Areas (November 2016), is available for download in summary and detailed versions at www.ProtectedLands.net/vision. Complete PAD-US data will support job and economic development across America, boost outdoor recreation opportunities, allow for more effective approaches to siting and mitigating energy production and transmission facilities, aid in reducing chronic disease through outdoor exercise, safeguard at-risk wildlife and habitat, encourage more use of local, regional and larger parks for people from all walks of life, and to many other U.S. needs and policies. The action plan presented in the report calls for completing the current Protected Areas Database of the U.S. (PAD-US) by 2020, and maintaining it thereafter. Parts of PAD-US are close to complete now, but local and regional park data needs additional work, along with system improvements to make the database more effective for users in government and the private and non-governmental sectors. This program has support from a number of agency and nonprofit partners, but needs additional support to succeed. Published by the Gap Analysis Project of the U.S. Geological Survey, PAD-US is a GIS (geographic information systems) database that has the boundaries of preserves as small as neighborhood parks all the way up to wildernesses and national forests. These boundaries included lands owned outright, designations for uses of land (e.g., Wilderness Areas), lands under conservation easements and marine protected areas. A total of 3 billion acres of land and water areas in 150,000 units held by over 15,000 agencies and nonprofits is currently in the PAD-US data. PAD-US data is developed through a partnership of federal land management agencies, state data steward organizations and national nonprofits. A ten point plan to complete PAD-US is estimated to cost a total of $7 million over three years, of which just under $3 million is currently secured. Funding needs to come from public agencies, foundations and potentially even businesses. These resources will support state efforts to improve local data, and federal efforts to improve data quality and the efficiency of getting and compiling the data. PAD-US will collaborate with related efforts, such as the Trust for Public Lands’ ParkServe program, which is developing data on local parks in all U.S. urban areas. The goal is for an annually updated database of public parks and protected areas, made freely available to users of all types. USGS will continue to coordinate the effort in partnership with other agencies and nongovernmental organizations, as well as to develop and publish the PAD-US database itself. The report on PAD-US was prepared for the USGS Gap Analysis Program by the Great Basin Cooperative Ecosystem Studies Unit at Boise State University and the nonprofit GreenInfo Network, and supported in part through an interagency agreement with the Centers for Disease Control and Prevention (U.S. Department of Health and Human Services) and the National Park Service (U.S. Department of the Interior). I’ve watched this report evolve and it’s exciting to see everything come together to convey this message so completely and concisely. Parks are a critical part of our country’s public infrastructure that can improve the health of individuals, families, and communities. But too often people do not know where they are. A validated, publicly available, national inventory of park locations can serve as a foundation for maps, mobile applications, research, park system plans… and the list goes on. This framework highlights that a national park inventory is both beneficial and doable.